This entry was posted on Wednesday, February 26th, 2014 at 11:05 am and is filed under church and state. You can follow any responses to this entry through the RSS 2.0 feed. Both comments and pings are currently closed. Things were different in 1925. This is true. We have become less bigoted as a society and more wise about the impact our actions have on marginalized classes of people. It’s for that reason, because times have changed and we are better people, that we should remove the cross. It’s for the same reason that the Redskins should change the name and mascot. It’s for this reason that flying the confederate flag is losing acceptance year after year. Tradition is important, but when it comes tangled up in bigotry and intolerance, then it needs to be corrected or rejected. That being said, perhaps there is a middle ground. Perhaps, if there is real historical significance to this cross, then a plaque should be erected explaining the historical intolerance that such a display represents. Because we are better people now and the times have changed. The Crucifix is first an foremost an instrument of torture. The symbol was adopted by Christianity, and turned it into another image. Even when I thought myself to be an atheist I was against such actions and still am to this day. Taking down the cross is nothing less than the destruction of a monument. The fact is that that monument is a part of our history. Our history as a Nation. You are not allowed to whitewash it. And I commend the author of this post for his tolerance. I think you need to add “how compelled am I to be witness to it?” Ten Commandments in courthouse lobby? I can’t avoid it, highly compelled when I have to go to court for my traffic ticket. 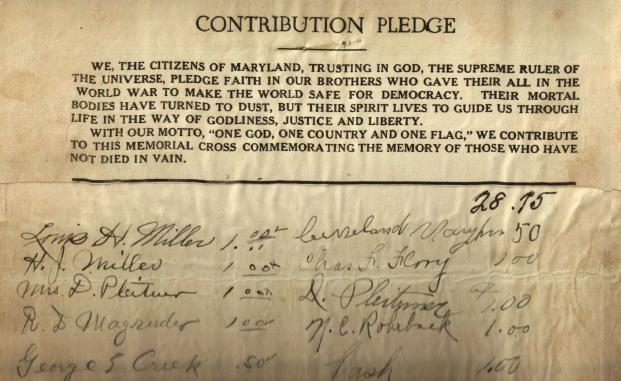 “Under God” in the Pledge of Allegiance? Are you freaking kidding me, you expect me to SAY THE WORDS “UNDER GOD”? Highly compelled. Cross in a park? Probably not so much. I think this also blends well with the query on the purpose – those with improper purpose are doing it exactly because they want to force you to be subjected to it. I seem to recall that Harry Anslinger’s “War on Marijuana” has been around since at least the 1930s; should we give Drug War laws a pass as well? Keep people in jail for years if not decades for possessing some quantity of weed? Keep busting them today? The point is, longevity doesn’t equate to constitutionality. A Christian cross on public land cannot be construed as anything other than as PRIMARILY an endorsement of the Christian religion, no matter what other function it may (have) served. And let’s remember, that if there are any WWI vets still alive, they’d be over 100 years old, so it’s not as if THEY’re going to object to its removal. The simple fact is, the federal and many state governments are waist-deep in endorsement of religion, whether with school vouchers, prayer breakfasts, anti-contraception legislation, anti-abortion legislation, “In God We Trust” on our coinage, “under God” in the Pledge of Allegiance… the list goes on and on. Did I say “waist-deep”? Try neck deep. Trying to burn the impurities out of our society will destroy it. It is a world War 1 memorial leave it be. Does desecrating a grave do no harm because the person it belongs to is not alive to experience the dishonor? The cross is only permissible on public land to the extent that it has become a quaint reminder of an obsolete religion, like having obelisks all over when no one believes in the sun god Ra anymore. It is Christians who should be anxious to have crosses removed from public land if they feel the symbol should remain religious. Actually, there are still Ra-worshipers. One more minority religion. I first see it as a monument and destroying it would be nothing but barbaric.